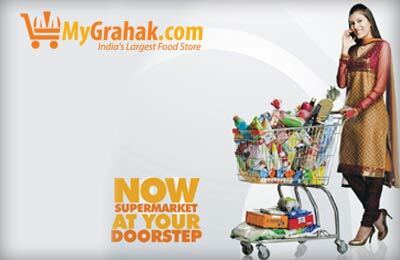 MyGrahak.com, the first and largest online retailing platform in India selling food, grocery and household items has announced that the portal is now open for public in Delhi & National Capital Region [NCR]. MyGrahak, currently, has 8,500 registered families using the portal to buy from a range of 10,000 SKUs (Stock Keeping Units). Founded in December, 2010 by the young visionary Mr. Ambuj Jhunjhunwala, MyGrahak Shopping online Limited plans for a turnover of Rs. 1,000 crore by 2015. MyGrahak.com is opening a new entire category for e-commerce in India. E-retailing of food and groceries in India has not been attempted by anybody and thus MyGrahak is a pioneer here providing convenience and comfort for ‘Time Poor and Money Rich’ customers. MyGrahak makes products available to customers at a click or call. While supermarkets offer customers 3V’s - Value, Variety and Volume, MyGrahak offers 3C’s – Convenience, Customer Needs Solution & Cost Effectiveness. Thus, all 3V’s are encompassed in one C of MyGrahak i.e. Customer Needs Solution. The venture is now all set to usher a paradigm shift in Indian retail sector, exploiting the low cost scalable and sustainable e-commerce platform and creating a new format e-retail for the consumers in the country. With retail on high growth trajectory, consumerism booming & e-commerce proliferating; this new format of food and grocery store will cater the needs of Indian consumers to have value for money, personalization and convenience of a typical supermarket, delivered at their doorsteps.